With three feet of snow outside, it’s a bit hard to believe that spring really is just around the corner. With spring coming, we want to remind you that taking care of nuisance animals is often much easier if action begins before the animals have their young. It’s said that God loves all creatures; not so for folks who deal with filth, garden or property damage, or when your animals are at risk. Solar pest control is both humane and effective: no poison, no physical harm to animals (including pets and people). There are lots of different solar powered pest control devices that help you get rid of nasty geese, dirty seagulls, plant-eating deer, and even potentially dangerous animals like coyotes or wolves. We’ve talked about the many benefits of solar pest control before and even created a short YouTube presentation/video about how it all works. What Types of Animals Can Solar Pest Control Help You Out With? Our store has ones targeted to many different types of animals, and we’ll soon be adding new eco-friendly and solar pest control products. 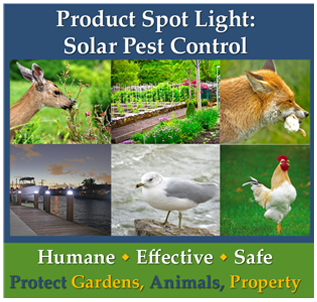 The images below show some of the animals that you can use our solar pest control devices to help protect what’s important to you. Deer can destroy gardens; what seagulls leave behind isn’t pleasant. Farmers, ranchers and even pet owners can benefit from the right solar pest control devices. Remember, these are one-time purchases, not things you’ll have to buy over and over again. Also, while we have Minimum Advertising Prices for most of our products. We often can also offer special deals with customers we speak to over the phone, especially when multiple units are being sold. All Rights Reserved. This post may not be used in whole or in part without express written permission. This entry was posted in About Solar Lighting & Solar Products, Pest repellents, Seasonal, Selecting & Caring for Solar Products and tagged control filthy animals, geese deterrents, get rid of geese, humane deer control, humane seagull control, solar pest control by SolarLightingSmart. Bookmark the permalink.